Swami Ramdev (born in 1965), also known as Baba Ramdev, is a Yog Guru. Yog is something not new, but its essence somehow got lost in the mists of time. People knew about it but very few were practicing is emphatically. Almost a decade ago Swami Ramdev reanimated the scope of yog and ayurveda. He has scientifically evolved prananyaam as well as yog, which were previously comprehended by Patanjali and many other well versed gurus. 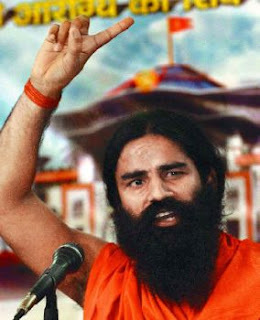 Ramdev was born as Ramkishan Yadav in Alipur, in the Mahendragarh district of Indian state of Haryana. 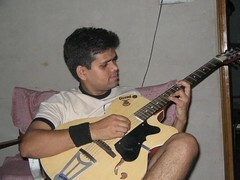 He attended school through the eight grade in Shahjadpur. Thereafter, he joined a yogic monastery (gurukul) in Khanpur village to study Sanskrit and Yog. Eventually, he renounced worldly life and entered into Sanyas (monastic living) - taking the name Swami Ramdev. Then he went to Jind district and joined the Kalva gurukul and offered free Yog training to villagers across Haryana. It is said that he travelled the Himalayas for several years before he settled in Haridwar. He discovered several medicinal plants in the Himalayas which he uses in treating his patients. Ramdev started relentless efforts to popularise Yog in 1995 with the establishment of Divya Yog Mandir Trust along with Acharya Karamveer. In 1995, Ramdev joined the order of swamis after being initiated into the ascetic order by Swami Shankerdevji Maharaj. While training to be a Swami, Ramdev spent many years undertaking an intense and thorough study of ancient Indian scriptures. At the same time, he also practiced intense self-discipline and meditation. He teaches that God resides in every human being and that the body is God's temple. He is a firm believer in the concept of Vasudaiv Kutambakam (the whole World is one family) and decries practices that discriminate on the basis of caste, creed or gender. His fundamental belief is that expressions of love, affection and compassion towards all living things are the true worship of the Creator. Ramdev has taught several aspects of traditional Indian scriptures such as Ashtadhyayee, Mahabhashya and Upanishads along with six systems of Indian Philosophy in various Gurukuls (traditional Indian systems of education). He has helped establish Gurukuls in Kishangarh, Ghashera, and Mahendragarh in India. He has also founded the Patanjali Yogpeeth Trust which has built several institutions. In addition to helping people learn about Yog and spirituality, these institutions also provide a comprehensive facility that promotes the practice of Ayurveda - the traditional system of holistic medicine developed in India. He teaches Pranayama which is a series of techniques for breath control that were developed as a part of the ancient Indian system of Yog. Heretofore, these techniques were often thought of as being esoteric and complex and portrayed as being unsuitable for lay people. Consequently, their use was often limited to advanced practitioners of Yog and undertaken only under the strict supervision of an experienced teacher. Ramdev has worked to break these barriers and help make the practice of Pranayama achievable by the ordinary layperson. His educational show is broadcast on Indian national TV (AASTHA channel) from morning 6-8 am and evening 8-9 pm (IST) several times a week and he also has dedicated shows such as Total Tandurusti airing on Zee network, a show on Sahara One at 9:00 am, Yog Science on IndiaTV at 7:30 am & 1:30 pm . Total viewership is in millions. According to the synopsis that is available to Sky Digital viewers, Ramdev " was a paralytic" prior to taking up Yog. He has been conducting Yog Science camps regularly all over the country, and sometimes abroad as well. In 2006, the Ramdev spent almost a month in London teaching Pranayam and Yog. Total attendance in these camps exceeds tens of thousands. Viewers of the TV show and attendees at the camp have reported significant improvements in their health - citing relief from many illnesses such as Diabetes, Heart Disease, and Hypertension. Well done Vinit. You have really worked and collected the required information about Ramdevji. He is truly a messenger in this Kaliyug. Yoga is known for centuries and we also know it from childhood. It was not considered as interesting. Today, because of Ramdevji, people glue to Astha channel, attend his camps in large numbers and I strongly believe that they are benefited. Thanks for ur encouragement Chetanji. No doubt he is the real messenger of Kalyug after Swami Vivekananda. ANd sure many have benefitted by his yoga. I am myself an example of benefittor of his yoga. Well Vinit,am very proud to belong to this Motherland to where Swami Ramdevji belongs. You have done a great job in creating awareness among people.Also at the same time spreading fruitful path of Yog Saadhnaa. I wish you a long & healthy life so to serve this path of Humanity. Really Swamiji presence has really made the difference, and he makes us feel proud, no doubt. Thanks for visiting and appreciating my small work frnd, thanks for ur wishes to me. I wish same for u too. Brim over I assent to but I contemplate the brief should acquire more info then it has. good job done vineet. i think more information can be added in it. 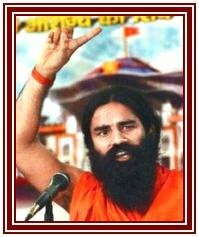 baba ramdev was born on 25 dec 1965. his village name is alipur near nangal choudhary near narnaul. his father's name is sh. ramniwas ji and mother's name is sh. gulab devi. he was taught by acharya pradyuman at khanpur gurkul (which is also near narnaul). All facts are not correct here. please confirm date of birth again. As per wiki, his year of birth is 1971.. Thanks for great information share me.. I began yoga lessons on the advice of my physician for the treatment of high blood pressure, to gain more physical flexibility and diminish back pain. I had already been working out by lifting weights three times a week and doing cardio three times a week on non-weight-lifting days. You have all been such patient and caring instructors, helping me to grow and foster my practice of yoga, and helping me integrate it into a healthier lifestyle. I look forward to practicing yoga together for many years.